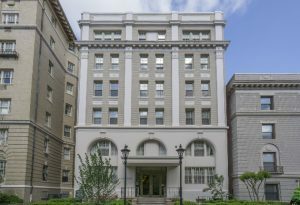 Kalorama Luxury Apartments in Washington, D.C.
Kalorama is a residential enclave in Northwest Washington bounded by three major thoroughfares: Connecticut Avenue, Calvert Street, and Columbia Road. Bordering on Rock Creek Park, this area enjoys a reputation for its natural attributes—its hilly terrain, cool breezes, and fine views over the city of Washington, as well as the close-knit village-within-a-city character of the community. The neighborhood is filled with architecturally significant houses and grand apartment buildings sited along curvilinear tree-lined streets. The Park Crest is among Keener Management’s finest real estate offerings. Featuring modernized 1920’s pre-war-style apartment homes, The Park Crest offers the charm of a bygone era with all the amenities of modern life. Located in the exclusive Kalorama neighborhood at 2070 Belmond Road in NW Washington, D.C., The Park Crest is one of the most sought-after rental locations in the area. Downtown D.C. is just a short trip by car or metro, making The Park Crest ideal for those who work in and around the nation’s capital. We invite you to come see our newly-renovated luxury apartments in person. One- and two-bedroom units are currently available for lease. Please call us at (202) 299-9145, or email us at parkcrest@keenermanagement.com to schedule a viewing. Learn more below about the interesting history and features of the neighborhood. Situated in the Northwest Quadrant of D.C., Kalorama is comprised of two distinctive neighborhoods – Kalorama Triangle and Sheridan-Kalorama. The area was primarily rural until 1893, when Congress drafted a proposal to include Kalorama as part of the growing D.C. urban region. Given its close proximity to the heart of D.C., it’s not surprising that Kalorama has housed its fair share of notable residents. Among them, former U.S. presidents Woodrow Wilson and Herbert Hoover, both of whom once had homes in the neighborhood. Barack Obama and family have lived in Kalorama since the end of his presidency in January 2017. Jared Kushner and Ivanka Trump also obtained a home in the neighborhood in 2016. The Kalorama neighborhood is rich with historical, architectural, and cultural sites. The Woodrow Wilson House offers an intimate look into the life of the Nobel Peace Prize-winning former U.S. President. The Phillips Collection, America's First Museum of Modern Art, is home to an impressive collection of more than 4,000 artistic works, including masterpieces of French impressionism and many contemporary pieces. Kalorama is within walking distance or a short drive from many of Washington, D.C.’s most famous landmarks, including the Lincoln Memorial, the Washington Monument, the Smithsonian Institution, and the White House. Ideal for families with children, 3½-acre Kalorama Park is a popular play site in the heart of the neighborhood. Further north, 1,750-acre Rock Creek Park (managed by the National Park Service) offers recreational opportunities and respite from the city. The area is served by a well-connected mass transit system that includes the Woodley Park Metro Station, several Metrobus lines, and a DC Circulator line (Calvert Street). The Kalorama community features abundant dining options—from the organic, local fare of Restaurant Nora to the ethnic cuisine of Russia House, a fine dining establishment that sits in a converted D.C. townhouse. Eateries, cafes, and restaurants of every variety, from Mediterranean to Japanese to classic American, are situated throughout the neighborhood. 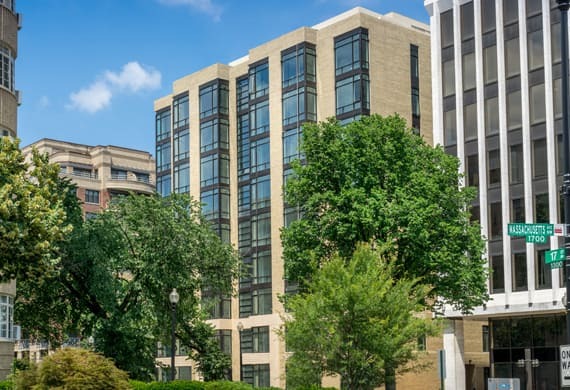 Contact the professional agents at Keener Management to view one of our Kalorama luxury apartment homes at The Park Crest by calling (202) 299-9145.